...well, okay. They are a little scary. This year in Pennsylvania, we get to have an entirely new test in the spring! 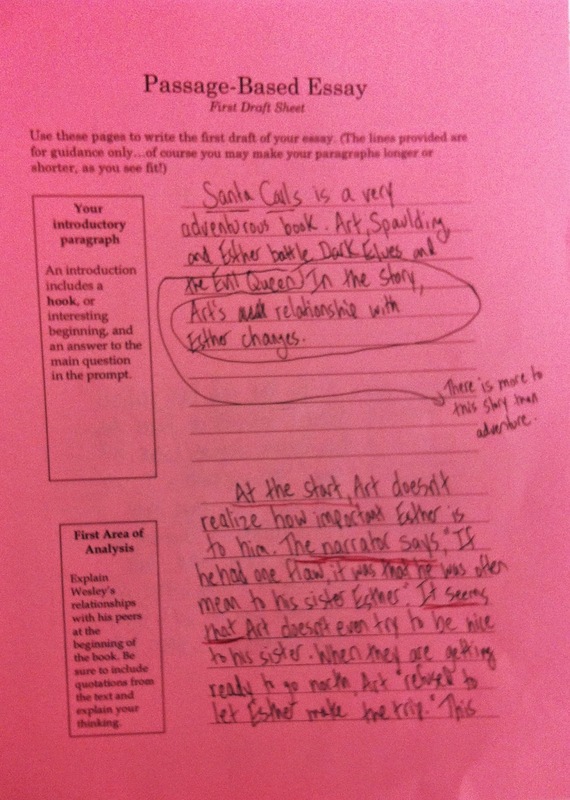 Instead of the standard open-ended responses of the past, students will have to write passage-based essays. In other documents, this writing has been called a Text-Dependent Analysis. I have been pretty nervous about this. The first samples that came from the state were awful--the kind of formulaic writing that no thoughtful teacher would want students to produce. "Is this what I'm supposed to do?" I thought. My next thought--"I'm going to have to do much better at TeachersPayTeachers, so that I can still have an income once the inevitable happens." Well, I couldn't stay pessimistic for long. After all, if I left the classroom, who would identify all of the bugs and the birds around the place? So the easiest path was to figure out how to help kids write good passage-based essays. Teachers who haven't worked with 9 and 10 year olds might be surprised at how challenging students find the process of quoting from text. They don't know how to choose the sentences to support their thinking; they don't know where to put the quotation marks; they get confused about whether to switch from first-person to third-person pronouns. Teaching students how to quote from the text in short, low-stress activities early in the year makes the passage-based essay process much easier. Step 2: Create a high-quality prompt to go along with a really great text. My students were working in three different texts in late November, so I made a prompt for each. The prompts were all similar--each one had two areas for analysis. In the story Molly’s Pilgrim, Molly’s feelings about school change. In the beginning of the story, Molly feels as if she doesn’t belong at school. By the end, her feelings have changed. Write an essay analyzing Molly’s feelings about school and how they change over the course of the book. Be sure to include specific details, including quotations, from the book. To help me keep everything straight I made prompts, checklists, graphic organizers, and rough draft pages on different colors of paper for each text. Step 3: Model, model, model! I decided to work through the process along with the students. I wrote a fourth prompt, this one for Santa Calls by William Joyce, and I modeled each step of the writing process, from dissecting the prompt to finding text evidence to putting it all together. It worked quite well to model-do--kids didn't have to sit and watch me for very long as I was just showing them the next chunk of what they would do. I feel very strongly that my modeling needs to show a sophisticated version of the product--the piece of writing that I can produce as an adult. Kids need to see the real thing. And I did show my real, true, crazy revising process, beginning each session by rereading what I had so far and smoothing out the wording. 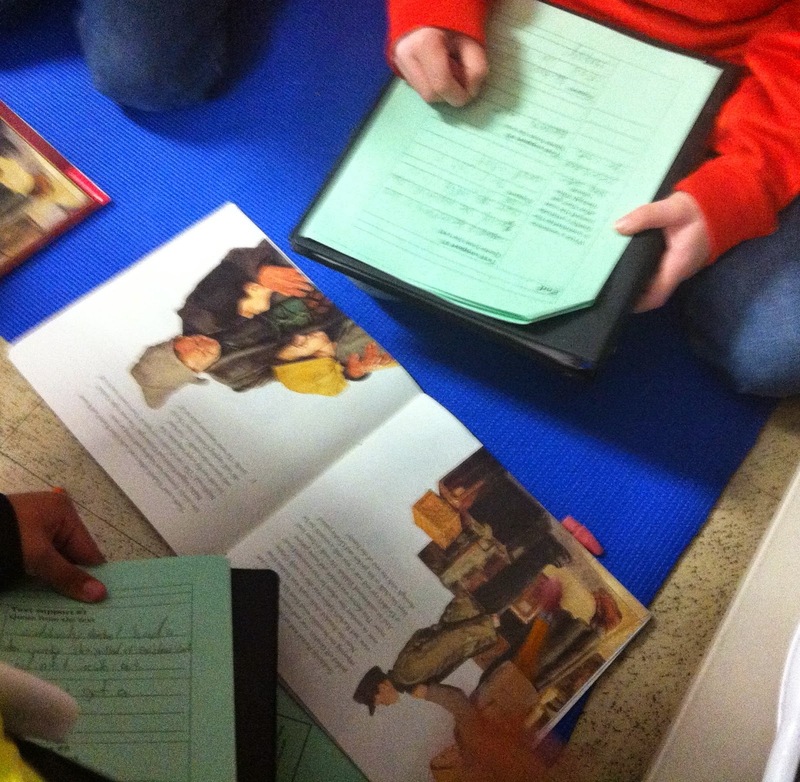 In my first reading class, students had read the books as literature circle groups. It was only natural, then, for them to continue to work in their groups as they moved into essay writing. Some groups worked cohesively together, while others chose to do parallel writing and only consult with each other as needed. (In my other class, which I co-teach, students did not work in groups--which I came to regret when I saw how nicely the collaboration unfolded in the first class.) There is so much in this picture that I love--the students sitting together on the yoga mat by the library, books open as they refer to the words and pictures to grapple with the ideas. I had estimated that it would take us a week to write the essays. Well, with discussion of reading homework and vocabulary, independent reading, and holiday schedule changes, it has stretched out longer. I feel a little bit panicked as I think about all that is before me, but I don't regret spending the time on these essays. Students have to do so much thinking as they consider the prompt, select text evidence, explain how the text evidence supports their statements, and write an introduction and conclusion! I felt a little Grinch-y as we worked on passage based essays two days before holiday vacation. After I modeled writing a conclusion, students settled around the room to work on their essays. One student said, in that contented way that fourth graders have, "This is fun." Trust me, nothing could have surprised me more. Fun? But this student wasn't trying to butter me up or make a joke. The work of creating, the work of weaving an author's words with her own thoughts to make something completely new--that can be fun. And it took a fourth grader to help me realize that passage-based essays aren't scary. Copies of the passage-based essay prompt, graphic organizer, and rough draft page can be found in this unit. This week, Pinterest has repeatedly coughed up a pin with a generic summary frame. "Use with any informational text!" the caption reads. This generic summary frame has lots of color and a bright, cheerful font. Basically it looks like this: "I read the text ____________. First ______________. Then I learned that ________________. Finally I found out ____________________." I wince every time I see it. If there is one thing that I know about teaching summarizing, it is that one frame cannot be used with every informational text. I first learned this more than 10 years ago, as I researched my first book, Summarizing, Paraphrasing, and Retelling. Intrigued by what I was observing in my classroom, I read scores of articles about summarizing, reading about how readers develop summarizing skills and how teachers can support this process. And there is so much to learn about summarizing! A teacher can learn so much about a student's reading processes by looking at a student summary. Some summaries are too long. Others do not reflect the main ideas of the text. Other students use the "copy and delete" strategy, copying some ideas from the text and leaving out others. One kind of summary that is particularly thorny for intermediate readers is what I call the "topic summary". This summary just gives a run-down of the main topics in a text: "I read about mummies. First the author explained how mummies are made. Then the author described why mummies are important. Finally the author told about mummies today." This is not a good summary! Notice how it just discusses the topics, but not the main ideas. When I have students who write these summaries (and usually they are strong readers), I know that we need to discuss the difference between topics and main ideas. These topic summaries can often be written by just running down through the headings of the text. But do they show a deep and rich understanding of the content? Not at all. Another problem with the topic summary is that it uses chronological order transitions instead of reflecting the structure of the text. In fact, a topic summary reads more like an account of the reader's experience of the text instead of showing the author's ideas. ...but what does a generic summary frame lead kids into writing? Yup. A topic summary. Teaching readers how to summarize is hard. But we need to acknowledge and embrace this difficulty instead of looking for a simple fix. Generic summary frames attempt to circumvent the real cognitive work of crafting a summary and boil it down into something simple. Getting really good at this kind of writing will not naturally lead into being able to write sophisticated summaries. Lots of things! The first step is to figure out what students can do independently. Give them an appropriately leveled text and have them write a summary. If they don't have any clue of how to begin, this tells you to start with some model summaries. Use short, familiar texts to show students what a good summary looks like. When students have a shaky understanding of a text, they produce oddly scattered summaries. This represents students' attempts to play the game of summarizing--they pick out ideas from here and there, without understanding how the whole text hangs together. 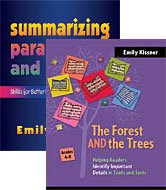 Techniques that focus on basic comprehension really help students who are writing these summaries. Try retelling nonfiction texts. When kids put ideas into their own words, they have to wrestle with the language and pin down the meaning. Next, show students how authors signal main ideas in a text with headings and topic sentences. If students write really long summaries with the main ideas of the text, they are probably comprehending well. Start by telling students, "Okay, cross out one sentence from your summary." Expect some resistance--"It's all important," or "I can't decide!" After some time, though, students will probably find at least one sentence to take out. Repeat, repeat, repeat! Eventually students will bring you their work and say, "Don't tell me to take out a sentence, because I already thought about everything that was most important and I only wrote that." All students can benefit from a scaffolded summary. Simply write a good summary of a text, and then decide which parts to give to students, and which parts to leave out. In a scaffolded summary, you can decide how much support to give to students. The scaffolded summary at the right is a very supportive frame, which gives students a great deal of language. It can become easy for kids to think of this kind of task as simply "fill in the blanks", so be sure to connect this to meaningful summarizing. (This particular summary is from Daily Warm-Up Activities, Grade 3). A scaffolded summary with less support can be seen here. Notice that this frame does not give any language specific to the text, but gives suggestions based on the text structure. It's different from a generic summary frame because it does not claim to be suitable for all passages--in fact, it only works for cause and effect text. Lately I've found that teaching summarizing as I teach each text structure yields great benefits. This page is from Cause and Effect Activity and Texts. Teaching students how to summarize is hard. Anyone who says differently is selling something...probably a generic summarizing frame.